PROTASIS releases the collection “Great Performers” which presents to the audience excellent musicians and performers. 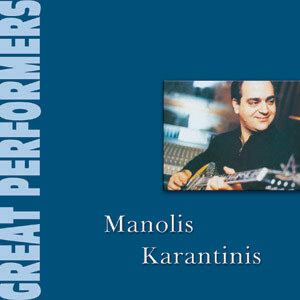 The first CD of this collection introduces Manolis Karantinis, who is undoubtedly the greatest “Bouzouki” virtuoso living in Greece today. His amazing skill enthroned him as one of the best performers and he has collaborated with the best Greek artists, like Stelios Kazantzides, George Dallaras, Tolis Voskopoulos, Marinella etc. In this record we find “Laika” (popular) instrumental pieces, mostly his own compositions, and a song by the fantastic voice of Eleni Tsaligopoulou. Enjoy pure Greek music by the best performer of this genre!